Copyright © 2005, 2006 by Lawrence A. Ruttman. All rights reserved. To receive a complementary copy for review purposes, or in order to prepare for a published or broadcast interview with the author, please contact the author by phone at 617.232.4464 or by email at lawrut@msn.com. Download higher-resolution jacket image or higher-resolution author photo (JPG or tif format). 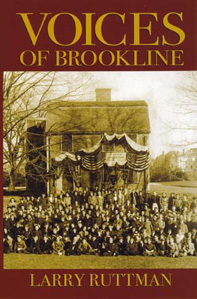 Material in Voices of Brookline and this web site may be copied only with permission of the author. Please contact the author by phone at 617.232.4464 or by email at lawrut@msn.com, and include specific information on the material you wish to copy and its intended use.